How to display month name in different formats in Java? Home Basic Date Questions How to display month name in different formats in Java? Write a program in Java that display month name in different formats. M or MM -> Display month in digits. MMM -> Display half month name. MMMM -> Display full month name. * @problem How to display month name in different formats? Output - How to display month name in different formats in Java? 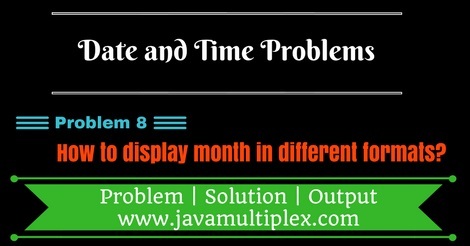 Tags : Date and Time problems, Display month in Java, Solution in Java, DateFormat, SimpleDateFormat, String.